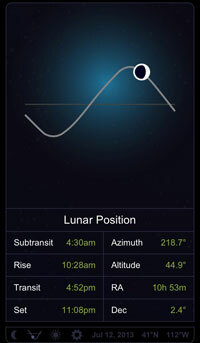 Luna Solaria is a new mobile moon app for iPhone/iOS and Android mobile devices. 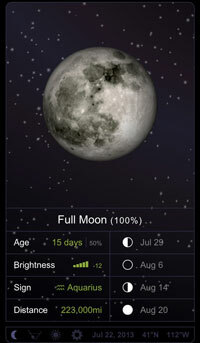 Now you can have accurate, attractive Moon and Sun details at your fingertips. View a beautiful real-time image of the current Moon phase, complete with technical data. Quickly see if the Moon is above the horizon on the Lunar Position screen, along with Moon rise and set times and precise Moon position in the sky. 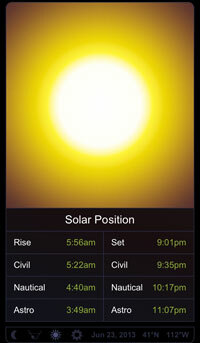 If you also want to know Sun rise and set times, look at the Solar Position screen. Luna Solaria is available FREE in the Apple App Store and on Google Play. If you have a Windows desktop computer and are looking for software with additional Moon details and calendar, take a look at QuickPhase Pro.